R.E.M. 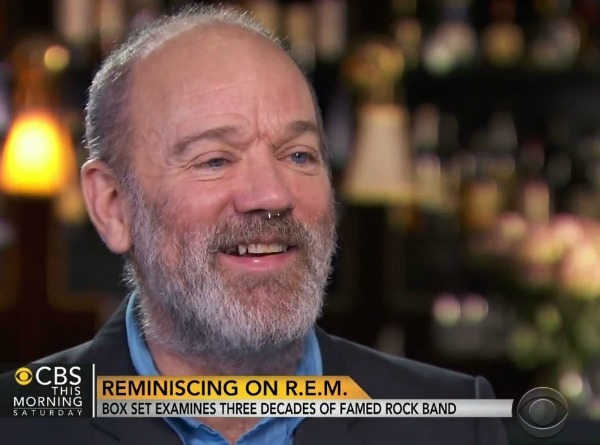 frontman Michael Stipe appeared on “CBS This Morning” today to help promote the recently released “REMTV” DVD box set, discussing the band’s history and his own future (“I think I’ll sing again. That’s maybe an exclusive. But I think I will sing again.”) and the (un)likelihood that we’ll ever see an R.E.M. reunion (“That will never happen. There’s no point.”). I believe it is a dangling staple. Was asking me the same question the whole time? What is it? Looks like a retainer for a septum ring. He’s having his midlife crisis 10 years too late. Do you think he has a Corvette? OOH! It HURTS to look at that thing in his schnozz. What do you mean “There’s no point”? Don’t make the same mistake of The Clash when you’re still relevant, Mumbles. The world needs R.E.M. It’s a lot colder, less-loving place without them. I love R.E.M. as much (if not more) than the next guy (at least from Murmur to Green). But I have to agree that there is no point. The Clash split (badly) at the height of their powers. And, there was so much acrimony between the members of the band when they split (or least when Mick got fired). A reunion seemed appropriate there because so much needed to be resolved (much like it was with the Stone Roses and would be with the Smiths). R.E.M. just is not in the same boat. The guys were all (good) friends and their time as a true musical force had long since passed them when they finally split. Moreover, unlike bands like the Pixies or the Replacements, who never really got their due when they were together, R.E.M. were hugely successful from both an artistic and commercial perspective. I hate to say it, but there really isn’t anything about R.E.M. that needs closure or resolution. For that reason, I have to agree that there is no point in a reunion. 1. The jangle of Pete’s Rickenbacker. 2. Mikey Mills playing funk bass in a way no white boy has any business playing it. 3. Bill’s one-upping Mo Tucker in the “Who can sound more like a one-person tribal drum circle?” stakes. I agree with everything you say. They were reasons that we loved them while they were together. But why get back together, other than to just continuing doing the same thing? It seems like, when they were an intact band, they did everything they needed to do, and there is nothing left except possibly tarnishing a pretty darn solid reputation and legacy. I do see your point, incidentally and it’s valid. You’re going the logical route and I’m arguing from the emotional standpoint, which isn’t the smartest, no. Because the same thing was fantastic and no one did/does/will do it better. The world’s a lot colder place without them. Well put! Personally I would’ve liked to have seen them end it with Bill playing drums on a track or two, ending the way they started. I love Michael. A ton. A relish every new interview from, Peter and Mike. I love R.E.M. with all my heart. That thing in his nose is beyond ridiculous. Maybe he’s going through a mid-life crisis, it was that thing in his nose or a tattoo? Ha! Or maybe it’s something between he and his boyfriend. CBS? Isn’t that still the old geezer’s network? Big Bang Theory and 2 Broke Girls are conceivably the only two CBS shows (not a news show, for pete’s sake) whose viewers might know about R.E.M. Of course, now my GRANDMOTHER knows. Gee, thanks for that. Hang on a minute. They had Ferg and still do for a few more days. He put The Damned on one night. He was interviewing a guy talking about how their kids were into The Replacements and Joy Division. Don’t dismiss CBS so quickly. There’s a diamond in the pile of dogshit. They were great and might re unite like others have done.